Exit Stage Left: The Snagglepuss Chronicles is a clever reinvention of an iconic 1960s cartoon character. Snagglepuss was originally a pink swishy wannabe actor and actual mountain lion in the Yogi the Bear cartoons beginning in 1959. 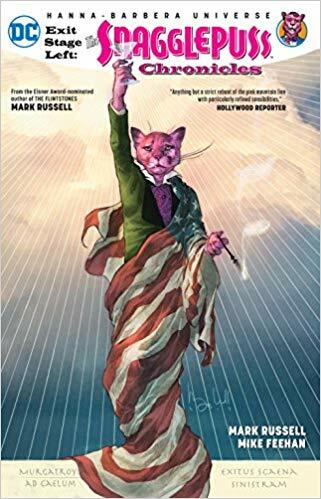 This comic, set in 1953, casts Snagglepuss as a successful playwright caught up in the McCarthy Congressional hearings looking for communist sympathizers within the show business community. I wasn’t expecting such a serious comic based on such a silly character from my childhood. However, Exit Stage Left: The Snagglepuss Chronicles won me over. Even though this is set during the 1950s, it brings with it the more accepting mindset of 2018. Snagglepuss is married to Lila Lion, who both has a beard and is a beard for Snagglepuss’ gay lifestyle with boyfriend Pablo. Pablo escaped from Baptiste’s Cuba after his friend is murdered by government thugs for being openly homosexual. Many famous icons from the 1950s appear: Dorothy Parker, Marilyn Monroe, Lillian Hellman, Joe Dimaggio, Clint Eastwood and Arthur Miller. Huckleberry Hound is also out of the closet and a novelist. Even the iconic Stonewall club is featured. Exit Stage Left: The Snagglepuss Chronicles is not a comic for everyone. It is a deep dive into mid-century politics from a modern viewpoint. I would recommend it to readers of historical fiction and fans of thoughtful movies like Hidden Figures and the Imitation Game. Since I embrace both of those categories, 5 stars!